The Neuro is world class in each of these criteria and is a prime example of Quebec’s vision for an integrated biomedical centre. The Neuro’s intense focus on neuroscience and neurological diseases, combined with integrated research and clinical care, makes it unique in the world and recognized internationally for its expertise. Institutions around the world benchmark their programs against The Neuro. For example, the new $400 million Tianjin Neurological Institute is modeled after The Neuro. An August 2010 Businessweek article quotes Rhode Island Hospital’s Chief of Neurosurgery and Director of their new Neuroscience Institute as using The Neuro as their model. Max Cynader, Director of the Brain Research Centre at UBC, has stated that The Neuro is an ideal model for developing their neuroscience pavilion. In Europe, the new NIHR Cambridge Biomedical Research Centre in the UK and the new Brain and Spine Institute in France are attempting to replicate the integrated Neuro model. In Montreal, the new MUHC Research Institute and the Douglas Mental Health University Institute are modeling their current and future developments on the research and clinical integration pioneered at The Neuro. 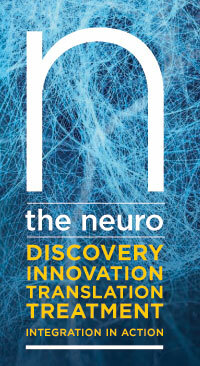 Integration at The Neuro enables research and innovation that benefit society. Patients benefit from being treated in an institution with a combined research and clinical mission. Integration nurtures formal and informal interactions among researchers, clinicians, and patients. At The Neuro, science informs medicine and patients inform science. Our approach has led to international recognition in the fields of epilepsy diagnosis and surgery, brain imaging, cognition, diagnostics of neurological diseases, human tissue electrophysiology, cellular neurobiology, Parkinson’s disease and movement disorders, brain cancer, brain microvasculature, and Alzheimer’s disease (biology and advanced diagnostics) and more. The Neuro’s integrated approach has led to changes in clinical practice, defined the direction of research fields targeting disease, led to enabling diagnostic tools and propelled therapeutic development. The Neuro has more clinician scientists under one roof than any other neuroscience centre in Canada. These individuals are critical to The Neuro’s mission. Their work spans the gamut from discovery to treatment to community and back. The added value of these interactions is acknowledged by researchers and clinicians, and importantly by patients who actively seek out experts at The Neuro and want to entrust their health to a research-driven environment. Neuro patients know they will have access to the latest approved treatments or procedures, and believe their involvement in research is valuable for themselves and for the community. In return, patients invaluably enable and inform the research conducted at The Neuro, furthering our understanding of neurological conditions.